I'm Sold! My mom bought me this set of Rachel Ray pots and pans as a housewarming gift. And I have fallen in love with them. They make cooking easier, food cooks evenly in the pan, and more fun. 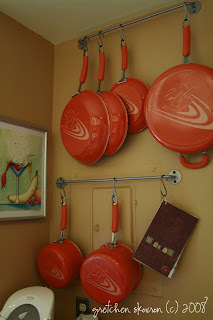 Since our kitchen is small I didn't want to occupy an entire cabinet with pots and pans so I hung them on the wall, using rods from Ikea. They also add a nice punch of color. And they're so pretty! Lucky you! Here is where it all began!